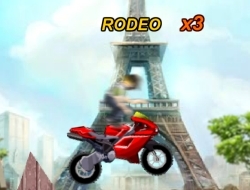 Sporbikes are really dangerous to drive, but in this great game you will have to feel the danger breathing on your neck and try to score one or two stunts on every jump. If you havent guessed it by now this is a driving game and you will have to get good times on each race if you want to win the tournaments. With the money you earn you can go ahead and customize your bike and your driver to look even cooler while jumping your motorcycle high up in the air and doing flips. Also these tricks you score will earn you nitrous and it is very powerful. Use it to increase your speeds before a long jump or if you want to reach the finish line even faster. Use the arrow keys to accelerate, break and lean. Use X to release your nitrous and Space to do tricks. Uphill Rush 3 0.00 between 0 and 10 based on 0 votes.